Mom, if you are reading this review, cover your eyes. Better yet, go check out my review of Joyce Meyer’s latest book. You shouldn’t be reading this review mom. You’re embarrassing me. Next, I want to thank the authors for recommending the book Stuck Up! : 100 Objects Inserted and Ingested in Places They Shouldn't Be. I need to read that book. And now for everyone else, please bear with me as I try to write this review whilst working around the censors. I’m assuming you’ll know what I mean by manhood and rear orifices. The main goal of DON’T PUT THAT IN THERE! 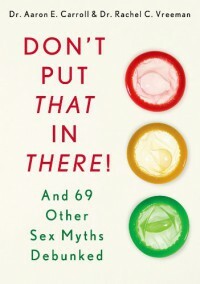 is to dispel the myths, to validate experimentation, and to prevent diseases and unwanted pregnancies. Real quick: yes, it is okay to swallow; no, there’s hardly any chance to catch something from a toilet seat; and, yes, you can get pregnant using the “pulling out” method. For you men, you may or may not be within average range. A lot of this book finishes answers with inconclusive findings, but offers a chock-full (not that other word; get your mind out of the gutter) of evidence and research to get you thinking. In this instance, when men self-reported online their manhood measurements, the numbers were a bit larger compared to the urologist-conducted study. Sure, one measured hard and the other measured yanked flaccid members, but it gets you thinking. I’m writing this during World Cup time. There are some teams with pre-game rules about hanky-panky. They should also read this book; there’s a chapter about that. Interesting topics and lots of evidence makes for an interesting read. With that, I thank St. Martin’s Press for providing me with an electronic review copy of this book for review. Now, I need to go re-read that Joyce Meyer book myself.